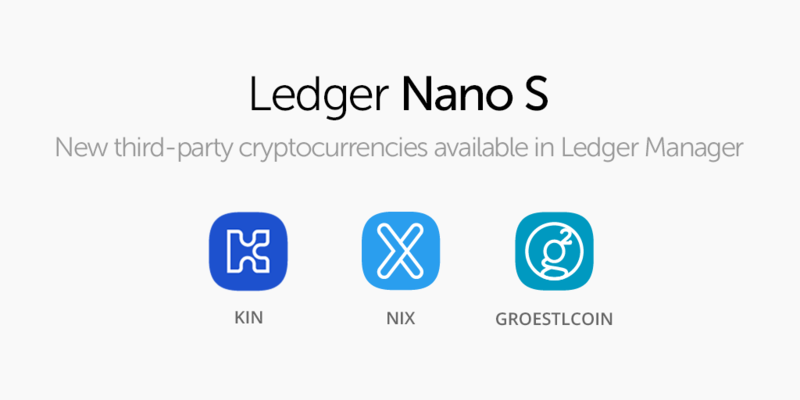 On this CryptoTuesday, Ledger adds Kin (KIN), Groestlcoin (GRS) and Nix Platform (NIX) to the Ledger Nano S. The Groestlcoin and Nix Platform apps are compatible with the Ledger Blue as well. These three applications have been developed by their respective communities, bringing the number of third-party developed apps published through CryptoTuesday to 35. Thanks to this edition of CryptoTuesday, the Kin, Groestlcoin and Nix Platform applications can now be downloaded through the Ledger Live manager application. These are compatible with their corresponding third-party wallet applications. You can find more information by referring to our help center and our coverage pages. In due time, Ledger Live will incorporate full support for third-party applications to ensure that Ledger users can not only install, but equally manage their cryptocurrencies directly through Ledger Live. CryptoTuesday is a Ledger initiative that started in August 2018. Since then, a total of 35 crypto asset applications have been published on the Ledger Live application manager thanks to CryptoTuesday, adding to the 1100+ cryptocurrencies already supported by Ledger. This includes high ranking cryptocurrencies on coinmarketcap.com, such as EOS (4th*), Waves (21st*) and VeChain (25th*). CryptoTuesday is celebrated each first Tuesday of the month. For this occasion, we review applications that have been created by the communities of respective cryptocurrencies and publish them. We are incredibly grateful and humbled to have such active, engaged communities and enabled this monthly event to honor that. Naturally, there are certain requirements and procedures for these submissions, which can be found on this page. Plans and progress for upcoming application releases can be found on our Ledger overview: Internal and External developments page.